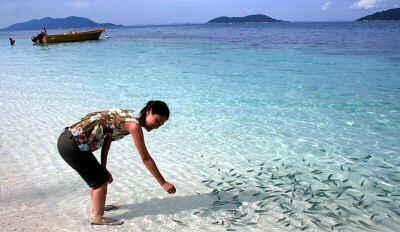 Rawa Island is a beautiful tropical island in Malaysia with really white beaches and deep blue water. The island is just 16 km away from the coast of Mersing and is also a good starting point for boat trips to visit the surrounding islands because, well... except for the 2 hotels (one of which is for backpackers only) there isn't anything: no shops, no villages, no restaurants, no nothing. Having said so, you can imagine what well to expect on Rawa island: peace and quietness, not too many tourist and the corals standing exposed in front of you when the tide is low. Again Mersing is the place to embark on a speed boat that brings you to this tiny island. Depending on the weather, this can be 30 minutes of smooth sailing or 45 minutes to 1 hour of a hellish journey that leaves you soaked from head to toe. So if possible book your transfer in the morning when the sea tends to be more calm. 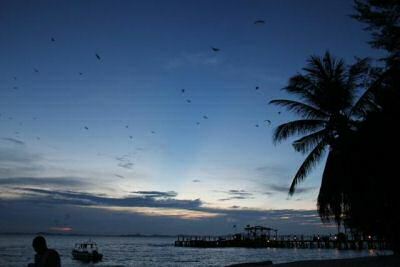 Once you set foot on the island, an unspoilt coral island with white sand beaches and swaying palms awaits you. Did I say white beach? 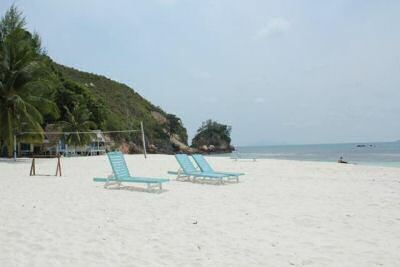 Yes, this must be the most white beach in whole Malaysia. Since you will go there for peace and quietness, avoid the weekends and public holidays when the local Malaysians hop over for a stay. 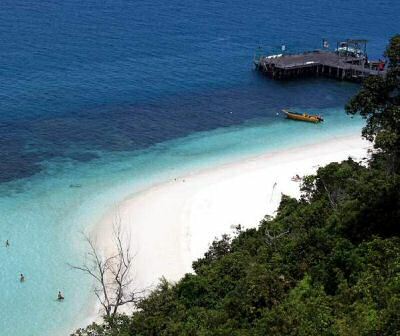 Daytrippers have to pay to enter the private island owned by some Malay prince, which adds to most tourists avoiding the island all together. For food, you have the choice of the 2 restaurants of the 2 resorts. When the weather is really bad and there are no supplies from the mainland coming in, do enjoy the ultimate freshness of a local catch prepared for you. Accommodation is done in basic yet comfortable chalets. Do not expect aircon in the backpackers resort - Le Club Rawa recently renamed Alang Rawa - though, in the other resort - Rawa Safaris Island Resort -, aircon is included and most welcome after soaking up the heath of the sun or just when you want to enjoy a cool night rest. Apart from airconditioning, Rawa Safaris chalets also come with hot water but without TV: however, the sunset you can admire from your beach villa is priceless. Expect to pay at least $130 US per person per night, full board. Your typical Rawa day will comprise sunbathing, enjoying the tropical breeze, swimming, snorkeling, diving, relaxing in the hammocks and enjoying the sunset or simply feeding the coral fishes near the jetty or just straight on the beach. If you want some exercise, you can go canoeing or wind surfing: anything that is not motorized is available. Other than that you island hopping or fishing trips can be arranged. Part of the protected marine park, the beautiful blue-green clear sea offers: coral gardens, colorful fish and large shells. Just remember: don't take anything with you and only leave your footprints behind. There is no dive master around, nor can you take diving lessons. However diving equipment can be rented from the shop of the Rawa Safaris Resort. Apart from the water and beach activities, you can walk up the hill (15 minutes walk) to the lookout point and have a birds eye view of the island (beach in front, cliffs on the other side) and if you wake up early, to enjoy a beautiful sunrise. You can also walk towards the end of the beach (left direction when facing the sea), climb over some rocks to enter a small cave with a spectacular arch. Rawa is a gem of an island, a haven of peace that will heal you from your daily stress!